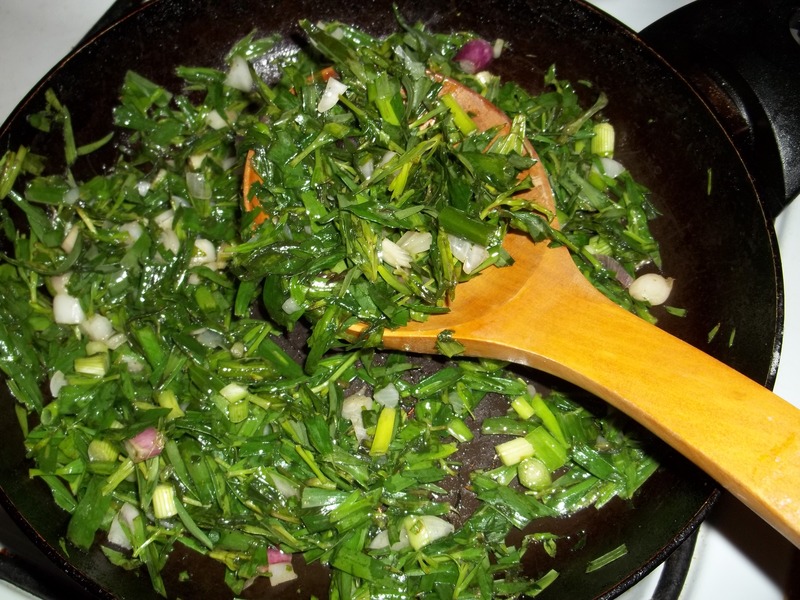 Georgians are very fond of the herb tarragon, which they call tarkhuna (Georgian: ტარხუნა), and find many ways to consume it, including in meat stews, with grilled trout and in herb salads. There is even an emerald green tarragon-flavored soda drink. 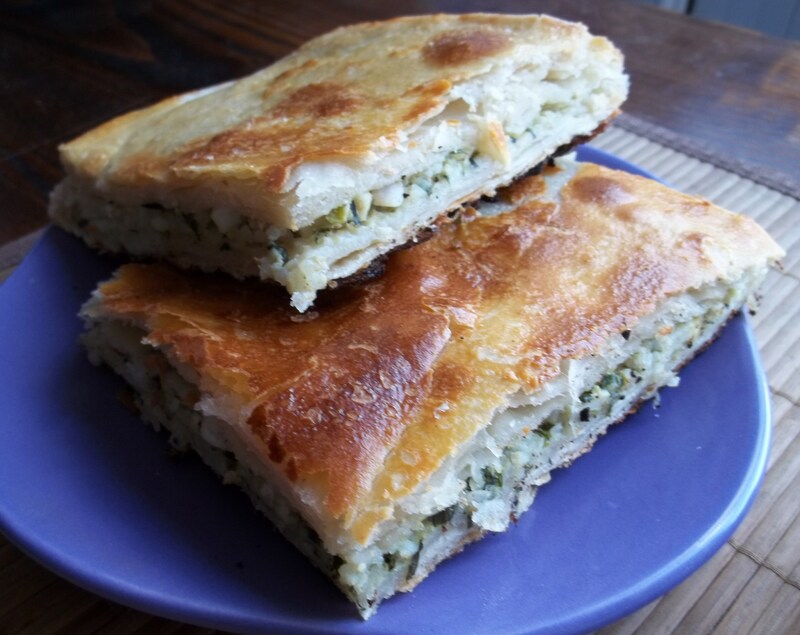 In this recipe we will show you how to make a popular Georgian tarragon and rice flaky pastry dish. 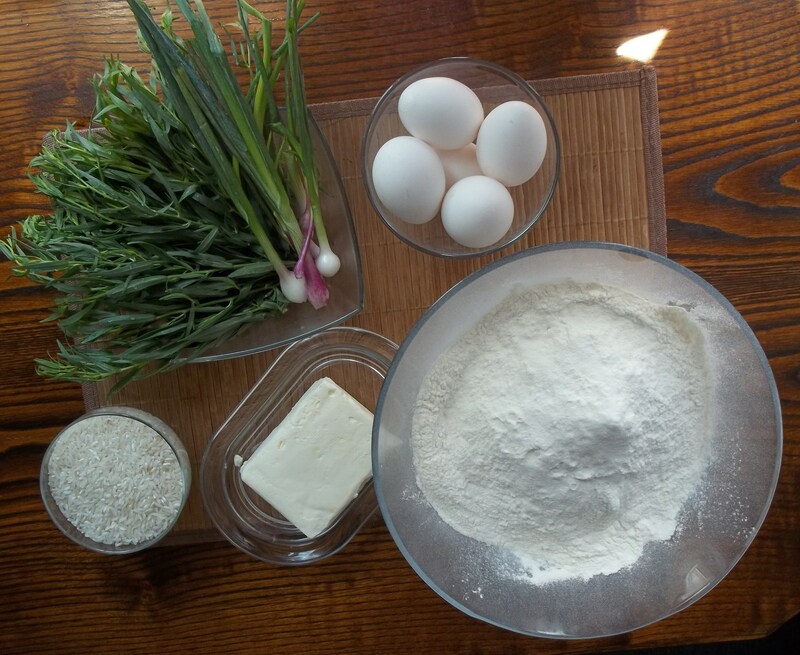 Flaky Pastry: 1 kilo of white flour, 1 egg, 160 grams of butter, 400 ml tepid water and 1 tsp of salt. 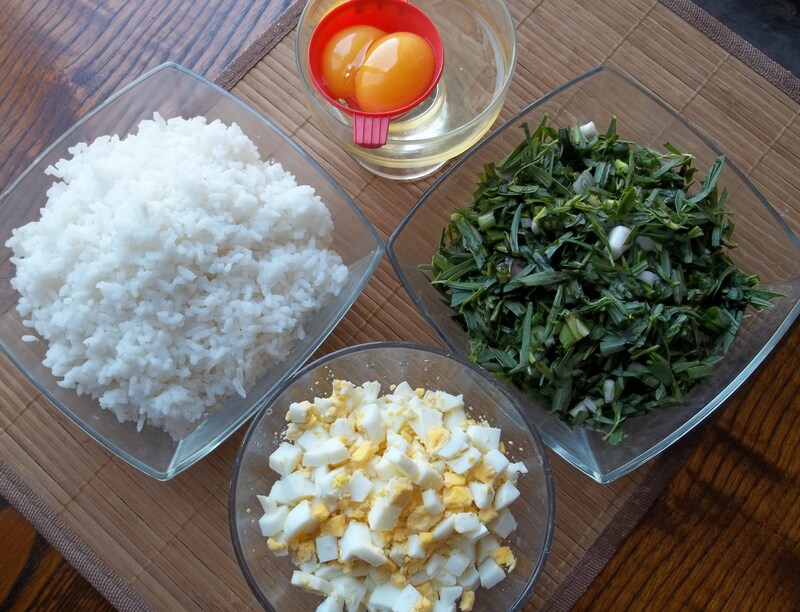 Other Ingredients: 70 grams of rice, 5 eggs, 200 grams of fresh tarragon, 200 grams of green onions, pinch of black pepper, 1 tsp of salt, 5 grams of butter, 10 ml of oil. 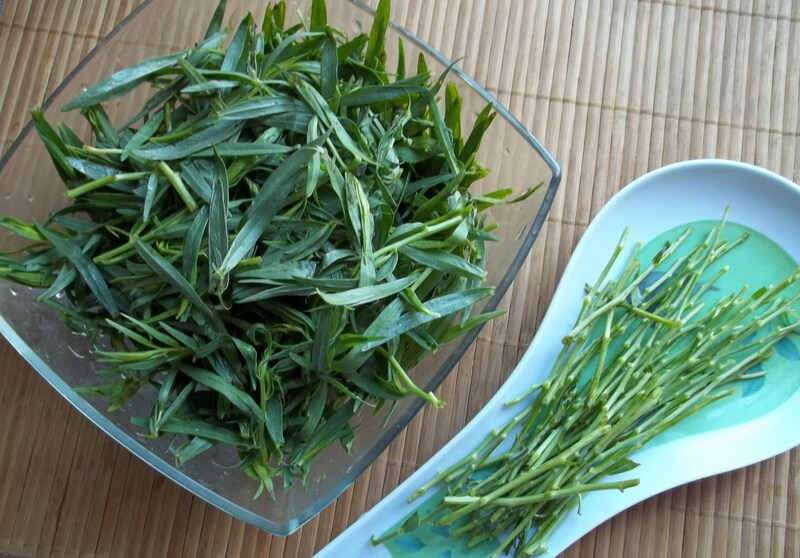 Pinch off tops of the tarragon and strip leaves from stalk. 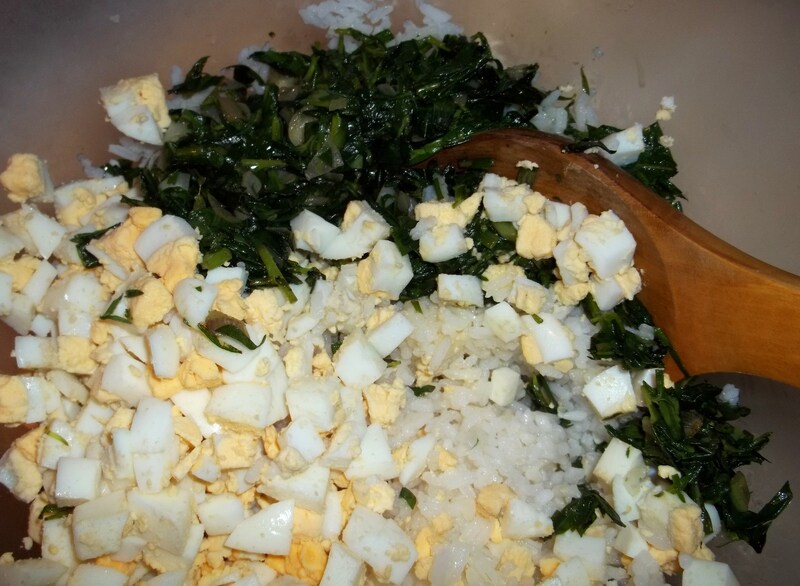 Boil the rice in salted water, boil 3 eggs and chop, separate 2 raw egg yolks (keep the egg whites) and chop the tarragon and onions. Stir fry the tarragon and onions in hot oil for a maximum of 1 minute. 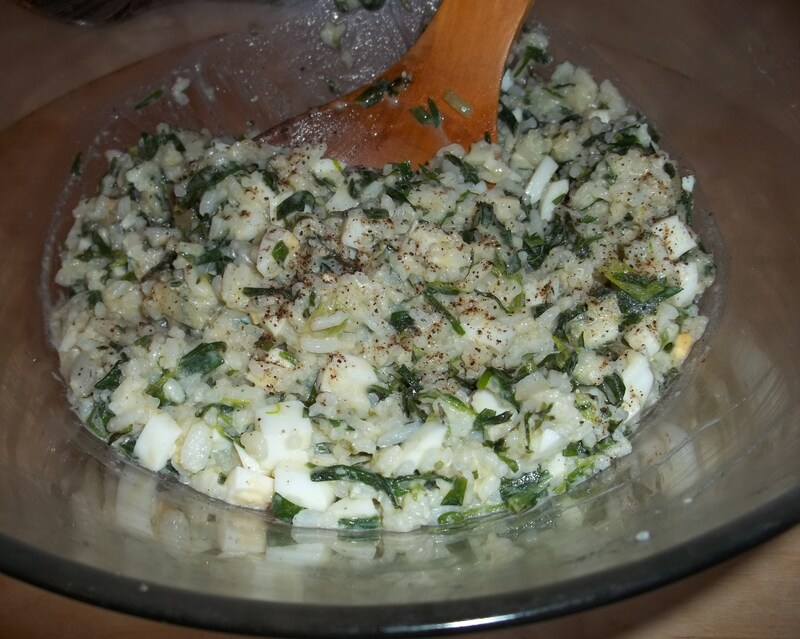 Mix the chopped eggs, egg whites, rice, tarragon, onions, salt and pepper in a mixing bowl. The mixture should look like the picture above. 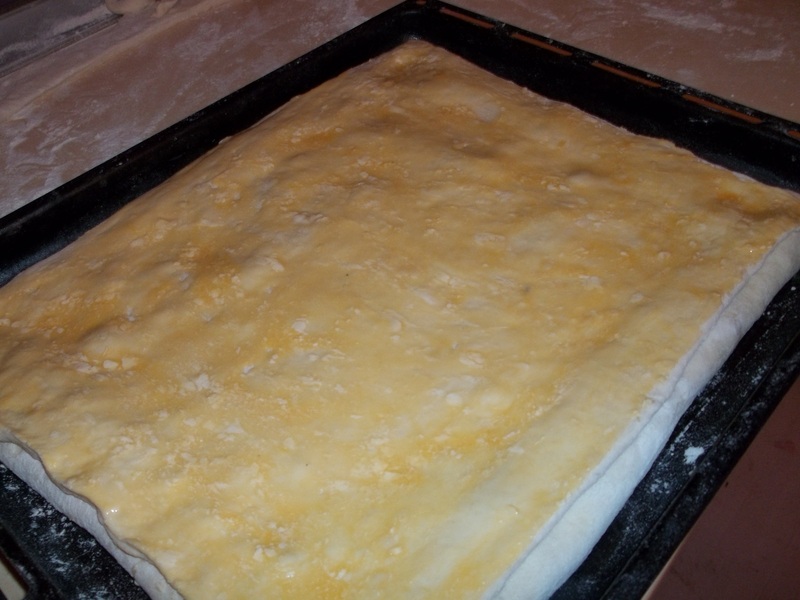 Remove flaky pastry dough from the refrigerator. 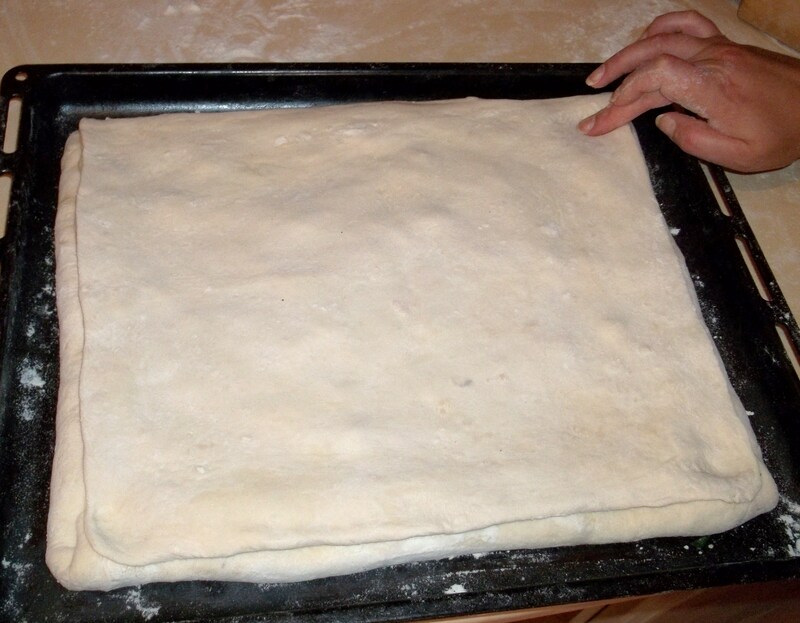 Roll out the dough to make a rectangle 22 x 42cm. It should be 6mm thick. 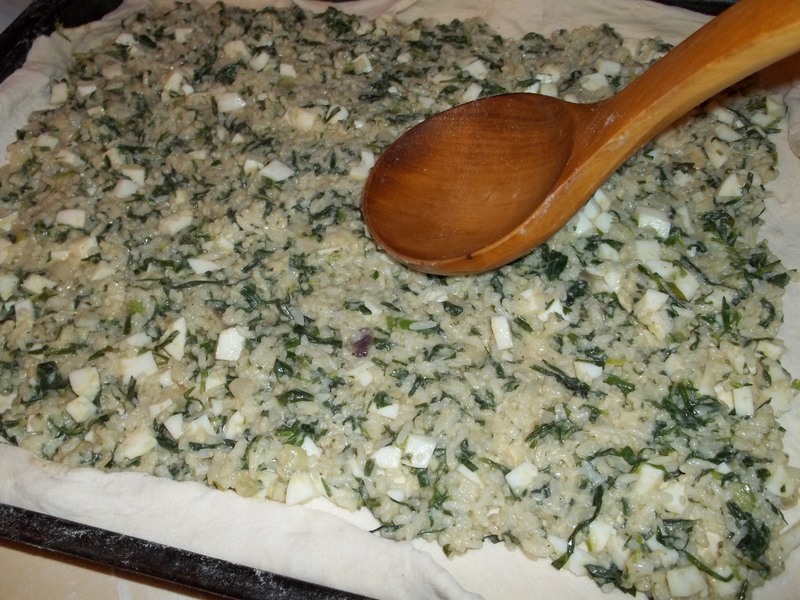 Spread the tarragon mixture evenly across the dough, leaving a 6 cm gap on each side. 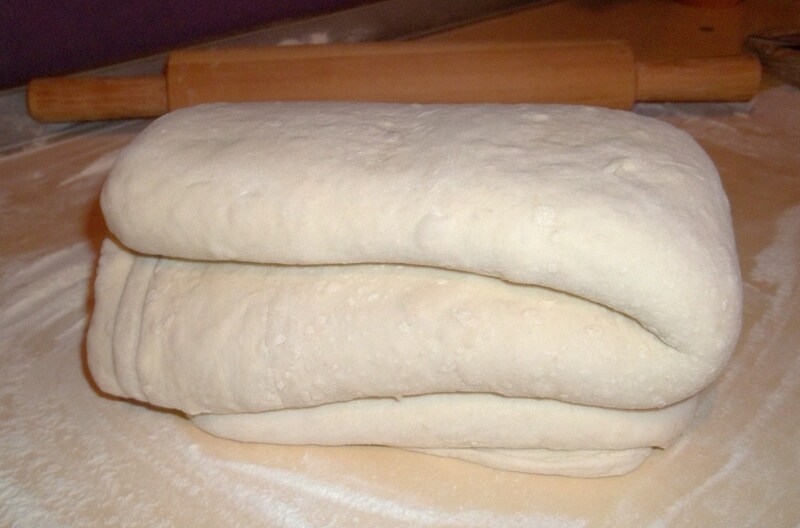 Fold the sides of the dough over the outer edge of the mixture as shown in the photo above. 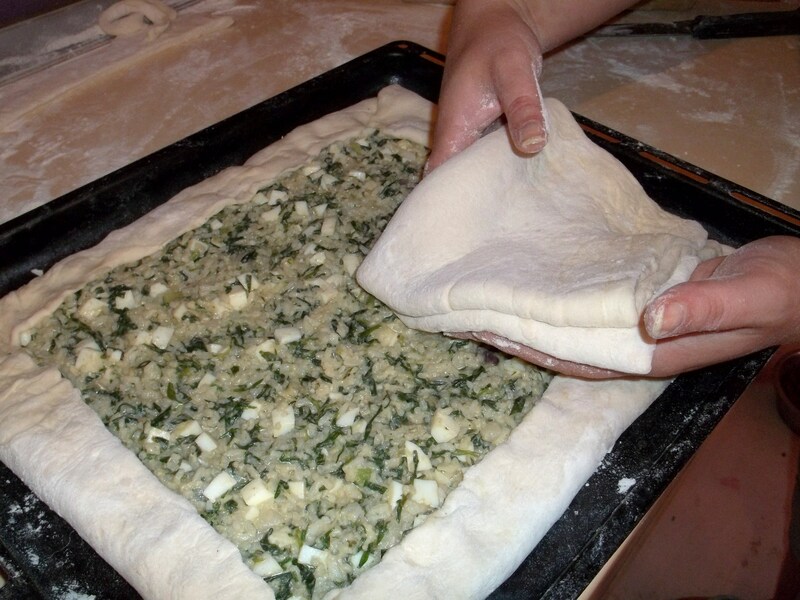 Roll out another rectangle of flaky pastry dough (16 x 36cm and 6mm thick) and cover the tarragon mixture as shown in the photo above. 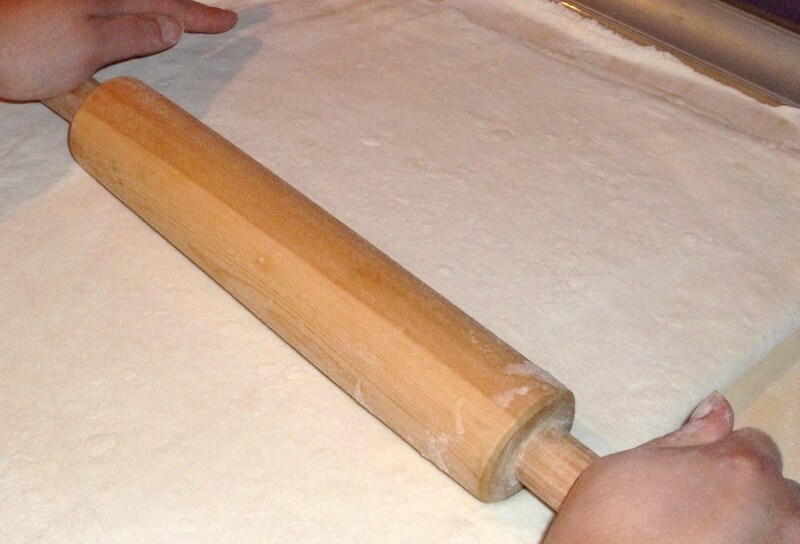 Pinch each corner of the dough. Whisk 2 egg yolks and 5 grams butter and brush the mixture over the dough. 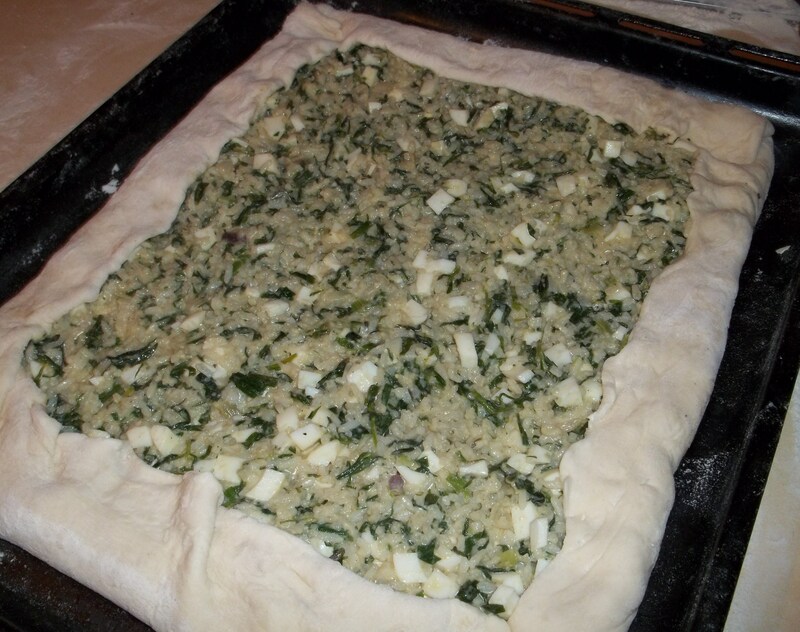 Place in the oven and bake on a medium heat for about 25 minutes (until pastry turns flaky and golden brown). Remove from oven and cut into portions. 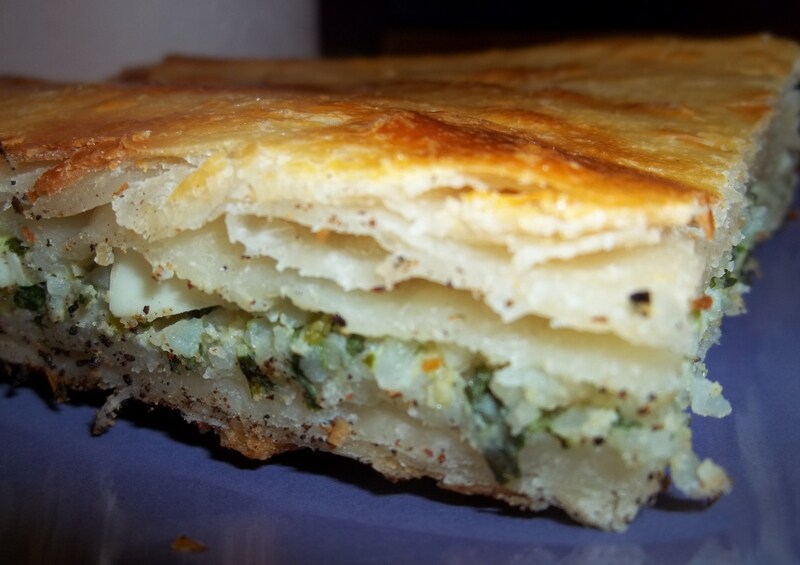 Congratulations, you have just made a delicious tarragon and rice filled flaky pastry! Enjoy! CLICK on the logo to visit GEORGIA ABOUT on Facebook and see photos and news about Georgia. Click LIKE on the page and become a friend of GEORGIA.